When I know I'm home | JustRunLah! Running makes me feel home. 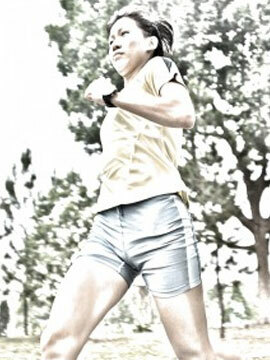 Just the motion of running feels natural, like something I was meant to do. I recall three moments that deepened my running experience. I fell in love with running at 16. Evening runs kept me sane in the midst of preparation for O Levels. On one run, magic happened. I floated in the air when one foot pushed off the ground, descending slowly till the other foot hit the ground and propelled me into the air again. Time seemed to have stopped. By the end of the run, I knew: I am a runner. I went on to join track and field in junior college and specialized in 800m. Weeks before the peak race, I got restless and anxious about my final track season. In training, I have run endless repeats of 200m, 400m and 600m and even of distances in between and 1km time trials, but not yet the sacred race distance. How would practice translate into the race? Would I be able to contribute to the team? Two weeks before the heats, the coach called for an 800m time trial, and I smashed my personal best by 4 seconds. Then I knew: my training had come together, and I was ready for my last interschool meet. I bettered my time by a second in the finals and more importantly clinched points for the team by placing among the top eight. After that swansong track race, I turned to road racing, mainly 10ks and half marathons. A knee injury sustained on a bike started a streak of injuries, which resulted in a painful, long hiatus from running. Last year, with the help of a heaven-sent physiotherapist, I started to run consistently. The day I ran 10 sets of 3 minutes—that’s when I knew that I was back. Eleven weeks later, I raced my first 10km in seven years, in a time exactly 2 minutes slower than my personal best. Nothing spectacular, yet I felt triumphant and hopeful. Contrary to my fears during the running hiatus that I would forget how to run and my potential was slipping away, I still have it within me. And beyond the finish line of personal bests, the journey of running is what I enjoy more. So even at a distance away from the best I can be, I am home.